Making paneer at home is a easy and simple process. You will find how to make paneer instructions below. Though paneer is easily available, homemade paneer is made within a few hours. The ingredients to make paneer are very few. You only need milk and an acid ingredient such as vinegar or lime juice or citric acid. You may use full cream or skimmed milk as you like. When fresh milk curdles while heating for any reason, you may use that milk to make paneer. (Do not use the curdled milk if it is stinking) Follow the simple instructions given below to make paneer at home. Heat milk in a thick bottomed pan. When it starts to boil, add lime juice. Switch the flame off. Stir for a minute. You will see the milk solids separating from the whey. Leave for about 5 minutes to cool a little. Use a cloth strainer or a plastic strainer with a fine mesh and strain the liquid. Once all the liquid is drained, rinse the solids under running cold water. This will remove the taste of vinegar or lemon. If you are using cloth, tie up and hang for about an hour. You may also keep the cloth wrapped paneer under a heavy stone, pan or a jug of water. Keep a thick kitchen towel below the wrapped paneer. That helps in getting the liquid out fast. For flavored paneer, you may add a little crushed pepper powder or chopped cilantro - dhania(fresh coriander leaves to the boiling milk. This flavored paneer can be used to make curries. But not the sweets. The amount of water to be taken out from paneer will depend on what you want to use paneer for. If using for deserts , you will need soft paneer and generally 1 hour draining is enough. When you can form a firm and smooth round with the paneer, it is ready to make sweets like rasagolla. 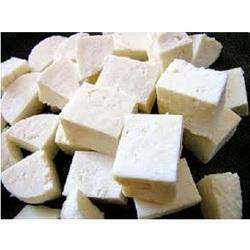 If you want to have paneer cubes, you need to make it a little hard so drain for a longer time. Shape in to a square or rectangular while still in the cloth and put the heavy weight on it. You will be able to cut into cubes later. You need to handle paneer carefully while cutting. The fresh but curdled milk can be used. If curdled milk is smelling bad, stinking or tastes bitter do not make paneer with it. Do not consume it. Just throw it away.